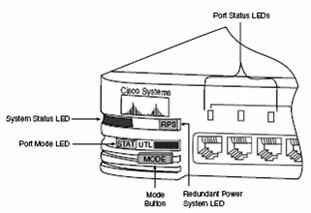 In preparation of our CCNA exam, we want to make sure we cover the various concepts that we could see on our Cisco CCNA exam. So to assist you, below we will discuss Switch Startup. A power-on self-test (POST) checks the hardware. A startup routine initiates the operating system. Software configuration settings are loaded. All network cable connections are secure. A terminal is connected to the console port. A terminal application is selected. 2 Attach the switch to the power source to start the switch (there is no on/off switch). ?-Displays a list of commonly used commands. More-Appears at the bottom of the screen when more information exists. Display the next screen by pressing the Spacebar. Display the next line by pressing the Return key. Press any other key to return to the user-mode prompt. s?-Lists all commands that start with s.
show ?-Lists all variants of the show command. show running-configuration-Displays the currently active configuration in memory, including any changes made in the session that have not yet been saved. show config-Displays the last saved configuration. show version-Displays information about the system hardware and software. show interfaces-Displays information on connections and ports that connect with other devices. 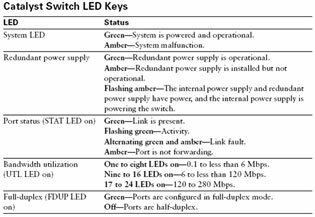 The Catalyst status LEDs are generally green when the switch is functioning and amber when there is a malfunction. Port LEDs are green during the POST. The power LED remains green when the test is complete. All other LEDs go off after the test completes unless there is a malfunction. After a successful POST, the Menu Console logon screen appears. From here, you can enter three different modes: menu (M), command-line (K), or IP configuration (I). The CLI has several help commands, including ? and show.